On 19 June 1968 Lt. j.g. Clyde Everett Lassen, a member of Helicopter Support Squadron 7, Detachment 104, Republic of Vietnam was serving aboard USS Preble (DLG-15). Citation: For conspicuous gallantry and intrepidity at the risk of his life above and beyond the call of duty as pilot and aircraft commander of a search and rescue helicopter, attached to Helicopter Squadron 7, during operations against enemy forces in North Vietnam. Launched shortly after midnight to attempt the rescue of two downed aviators, Lt. Lassen skillfully piloted his aircraft over unknown and hostile terrain to a steep, tree-covered hill on which the survivors had been located. Although enemy fire was being directed at the helicopter, he initially landed in a clear area near the base of the hill, but due to the dense undergrowth, the survivors could not reach the helicopter. With the aid of flare illumination, Lt. Lassen successfully accomplished a hover between two trees as the survivors’ positioned illumination was abruptly lost as the last of the flares were expended and the helicopter collided with a tree, commencing a sharp descent. Expertly righting his aircraft and maneuvering clear, Lt. Lassen remained in the area, determined to make another rescue attempt, and encouraged the downed aviators while awaiting resumption of flair illumination. After another unsuccessful, illuminated rescue attempt, and with this fuel dangerously low and his aircraft significantly damaged, he launched and commenced another approach in the face of continuing enemy opposition. When flair illumination was again lost, Lt. Lassen, fully aware of the dangers in clearly revealing his position to the enemy, turned on his landing light and completed the landing. On this attempt, the survivors were able to make their way to the helicopter. En route to the coast he encountered and successfully evaded additional hostile antiaircraft fire and, with fuel for only 5 minutes of flight remaining, landed safely aboard USS Jouett (GlG29). They never thought it would be a milk run. It wasn’t for Lt. Cmdr. John Holtzclaw, the pilot of an F-4J Phantom II fighter, and Lt. Cmdr. 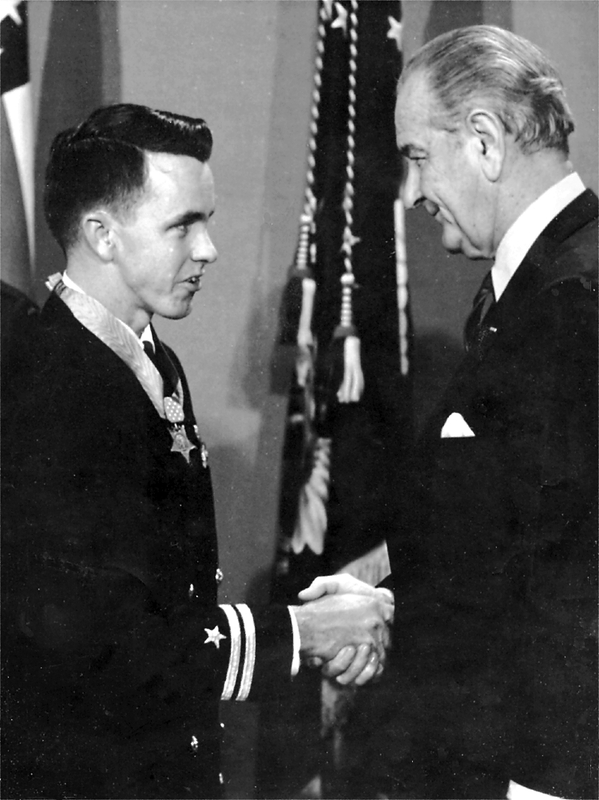 John Burns, his radar intercept officer. Their fighter was part of a three-plane night raid over North Vietnam, flying off the deck of the carrier USS America in the Gulf of Tonkin. It was July 19, 1968. The Phantoms were just north of Vinh Son, deep inside North Vietnam territory. The area crawled with enemy ground-to-air and antiaircraft artillery. It was also heavily populated with enemy soldiers and civilians. The two fighters approached from the east at 10,000 feet, flying at a speed of 500 knots shortly after midnight. They worked in concert with an A-6 medium bomber. But that night, the North Vietnamese troops and equipment were nowhere to be found. Then all hell broke loose for Holtzclaw and Burns. On their second pass over the area, his fears came true. Two of the telephone-sized Russian-made surface-to-air missiles flying at 3 ½ times the speed of sound headed their way. “We watched the missiles come up off the ground probably 10 miles ahead of us,” Holtzclaw recalled. Their Phantom out-maneuvered the first two SAMs. It was a black, moonless night. Because of the darkness, they weren’t sure how much maneuvering room they had. “We ran out of altitude, we ran out of air speed, we ran out of ideas,” Burns said, recalling their predicament three decades later. “When they shot the third SAM, we were low and slow. Evading the first two took it out of us. We were barely hanging in the sky. I knew the third one would hit us,” Holtzclaw said. “We were gonna take it right in the mouth. At the last second I jammed full rudder and jerked the stick to avoid eating it,” he explained. The missile detonated with a blinding flash of light beside the F-4. Their Phantom gave a death shudder from the concussion as it went down. The aviators landed in a rice paddy, not far from each other. They could hear the enemy soldiers talking as they searched the jungle for them. Burns had fractured his right leg, sprained his left ankle and strained his neck during the ejection and landing. Despite his injuries, his adrenaline was flowing. He made his way through rice paddies and jungle without complaint. At the time, Lt. j.g. Clyde Lassen was asleep. 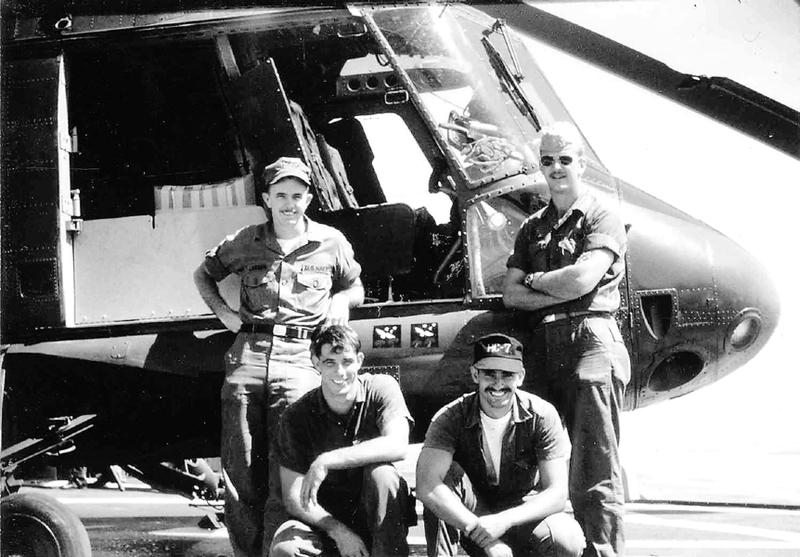 Minutes later he and his crew were airborne aboard their UH-2A Seasprint scout chopper. Except for Lassen, this would be the rescue crew’s first flight into North Vietnam territory. Lassen was a long way from Englewood, Fla. where he grew up and Venice High School where he graduated. “Clementine Two,” their chopper’s call sign, was dispatched to the crash site 70 miles away. When they reached the North Vietnamese coast, the enemy was waiting. They fired two SAMs at them. 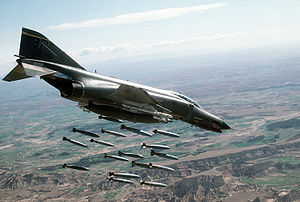 The missiles passed harmlessly by the port and starboard sides of their chopper as they continued to their rendezvous with the downed F-4 crew. Lassen located the area by homing in on the wrecked fighter still burning in the jungle below. He got a better fix from the radio signals broadcast by the fliers’ hand-held survival two-way radios. By this time, Holzclaw and Burns had been on the ground 1 hour and 45 minutes. They were hiding in thick jungle on a hillside. At times the pilots were within yards of searching North Vietnamese soldiers. This is the crew of Clementine Two that rescued the two downed Phantom jet fighter pilots in Vietnam on June 19, 1968. Clockwise from the top left: Pilot Lt. j.g. Clyde Lassen, Co-pilot Lt. j.g. LeRoy Cook, gunners ADJ3 Don West and AE2 Bruce Dallas. The helicopter crew made voice contact with the downed aviators shortly after arriving in the area. After the fighter pilots identified themselves, they told the copter pilot the enemy was closing in on them. They need help now! It didn’t work. The penetrator is connected to the cable the chopper crew lowers to downed aviators. It’s a metal contraption that unfolds into two chairs. This allows the hovering helicopter to lift the fliers to safety. As Lt. j.g. LeRoy Cook, the copilot aboard the chopper, recalls their third attempt to pick up the men was in an open rice paddy near the base of the hill. Again, Burns and Holtzclaw were farther up the hill and couldn’t work their way through the heavy vines and underbrush in time. Lassen realized his under-powered, overweight; single-engine chopper couldn’t rescue both men unless he lightened its load. He told Cook to dump fuel to reduce weight. This made it possible to get both fliers aboard, the copilot he said. But it also reduced the helicopter’s flying time considerably. As Clementine Two got into position and the penetrator was lowered again, the parachute flares, providing light for the rescue, went out. Without the flares, they were engulfed in darkness. The starboard side of the chopper collided with a tree damaging one of the horizontal stabilizer near the tail rotor and the starboard door. The door later blew off during the trip home. The chopper pitched right and headed ground ward. Lassen pulled it out of its descent into the jungle and certain death for those on board in the last second. He was forced to fly the damaged copter out of the area once more because of the possibility of enemy ground fire. He waited for a second flare plane to arrive. It was a long 15 minutes. Lt. Cmdr. John Holtclaw, pilot of the Phantom fighter jet shot down by SAM missiles explains what happened to them. Behind him, listening is LeRoy Cook, copilot of the chopper (center) and Clyde Lassen, the pilot. Lassen realized time was running out for all of them. When the second flare plane arrived, he landed again in a rice paddy at the base of the hill. He began his descent as the fighter crew tried to reach the landing zone. Again the downed fliers weren’t able to work their way through the dense jungle to meet their rescuers in time. They were driven away by the intense enemy fire. Clementine Two returned once more to the same spot, hoping they had given the grounded aviators time to reach the pickup spot. They still couldn’t make it. Lassen and his chopper crew flew out of extreme peril once more. The helicopter only had 30 minutes of fuel left in its tanks. It was questionable whether they’d make it back to the ship, even if they could get the two men on board. Lassen wasn’t going to give up now that the men were so near. Either he’d rescue the pilots with this attempt or he’d have to fly home empty-handed. By this time, Holtzclaw and Burns had picked their way through the jungle to the bottom of the hill. An enemy missile streaked by below the Seasprint as it began to land. Those on board could see the orange glow of the missiles’ tail when it passed. During Lassen’s final descent, the parachute flares from the plane overhead went out a second time. In desperation, he turned on the chopper’s landing and search lights as a beacon for the F-4 crew. Lt. Cmdr. John Burns (left) is pictured shortly after his rescue when he came aboard the missile frigate Jouett. They set down outside a little village under heavy enemy fire. Clyde maintained a lift on the copter so it wouldn’t sink into the mucky water of the rice paddy. They were sitting ducks. Burns had already broken out of the jungle concealment and was closing on the chopper. He was covered with mud, injured and running at flank speed when he fell in the tall grass in front of the copter. He scrambled to his feet and made the final dash for its open cargo door. All the while, Cook, Dallas and West kept suppressing fire on the enemy hiding in the jungle. “The chopper was about 60 yards away when I broke from the bush. When I got to the side door, the gunner grabbed me like a rag doll and jerked me into the helicopter,” Holtzclaw said. “Lieutenant, let’s get out of here,” West yelled to Lassen an instant later as he tapped him on the shoulder. Both F-4 aviators were safely aboard. Lassen revved the engine and pulled up on the chopper’s collective (stick). The Seasprint, with its heavy load staggered slowly into the air. They escaped the enemy-infested rescue zone in the nick of time. A minute or two later and they might not have made it. Their chances of making it to the Preble were slim. Under the direction of an air traffic controller aboard the USS Jouett, the helo was directed to the guided missile frigate’s deck instead of the Preble, further out at sea. The skipper of the Jouett, Capt. Robert Hayes, brought his ship within three miles of the beach. Then the captain ordered all his ship’s flight deck lights lit to help the chopper pilot find his deck. The frigate commander was within range of enemy artillery when he turned his landing light on. Hayes’ action saved those aboard Clementine Two. Lassen didn’t have to ditch his chopper into the sea for lack of fuel trying to make it home to the Preble. “We came straight in and landed because we didn’t have enough fuel to make a circling approach,” Holtzclaw said. “Clyde was a true hero,” Burns added. Died: 1 April 1994, Pensacola, Fla.
Commendations: Medal of Honor, Bronze Star with a “V” for Valor, Meritorious Service Medal, Air Medal, Presidential Unit Citation, National Defense Service Medal, Republic of Vietnam Service Medal, Vietnam Service Medal and Good Conduct Medal. This story was first published in the Charlotte Sun newspaper, Port Charlotte, Florida on Wednesday, November 11, 1998 and is republished with permission. Click here to view over 450 and counting — of Don Moore’s submissions to the collections in the Library of Congress Veterans History Project. Unfortunately, Mr. Lassen’s interview isn’t included as it wasn’t a first-person interview nor was Don submitting his interviews at the time of this writing. TAMPA — Conflicting views of the Vietnam War surfaced during commissioning of the USS Lassen, the Navy’s latest Arleigh Burke class Aegis equipped guided-missile destroyer at Port Tampa Saturday. 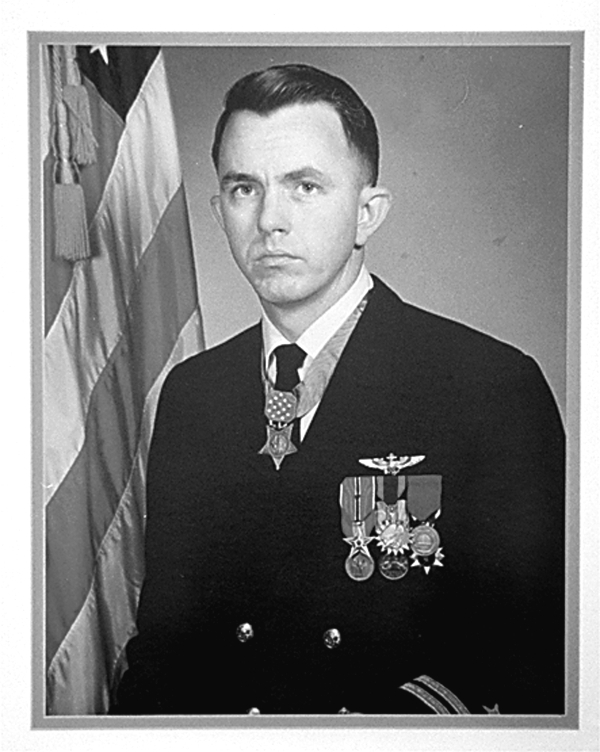 Clyde Everett Lassen, a reluctant Vietnam War hero who grew up in Englewood and graduated from Venice High in 1960, became the first Navy aviator in the Vietnam War to receive the Medal of Honor. 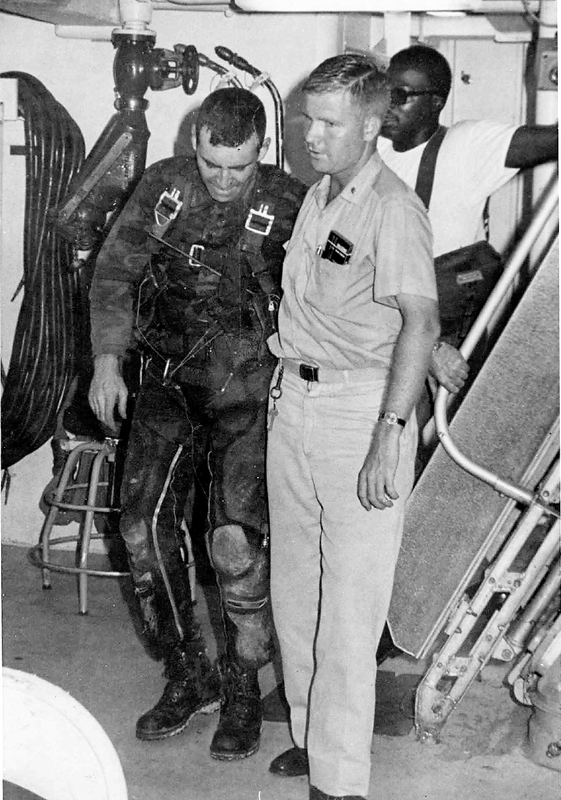 On June 19, 1968, he and his helicopter crew rescued two F-4J, Phantom II fighter/bomber aviators, John Holtzclaw and John “Zeke” Burns, who were shot down by an enemy missile deep in North Vietnamese territory. Lassen was 27 at the time. 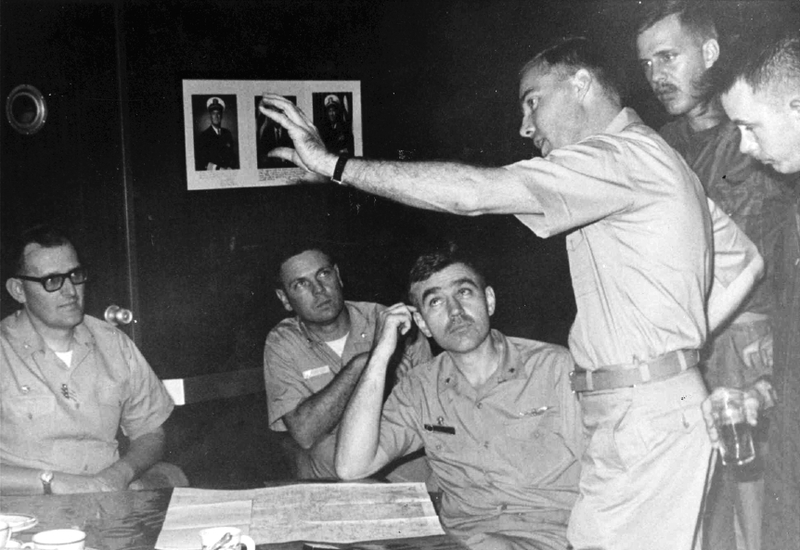 Burns, one of the two pilots Lassen and his crew rescued, views Lassen similarly, but had a totally different perception of the U.S. military during the Vietnam War. “I’m here to deliver a message from Clyde Lassen to the captain and crew of this ship,” the retired Naval aviator said with a bevy of admirals sitting to his right under a canopy amidships. “Clyde Lassen’s message comes from the example he set through a lifetime of dedicated service. “Some may wonder when a Vietnam veteran says, ‘Keep the faith’ what that means.” The answer, Burns explained, “The U.S. military did not know how to protect us in Vietnam. “‘Keep the faith’ is a credo, a watchword, a spirit for Americans who fought in Vietnam. LeRoy Cook, Bruce Dallas and Don West (other members of the rescue helicopter) ‘Kept the faith.’ We who fought in Vietnam ‘Kept the faith’. But no one ‘Kept the faith’ better than Lt. j.g. Clyde Lassen,” he said. Moore retold Lassen’s war story to the multitude seated at dockside behind the Tampa Aquarium under blue skies and a bright sun. The gray silhouette of the massive steel war ship towered five stories above the crowd. “On one special day in June of 1968, Lt. j.g. Clyde Lassen called up his courage, skill and dedication and flew one of the most daring rescues a valiant aviator ever attempted,” the three-star admiral said. “Battling darkness, enemy fire and rapidly running out of fuel, he and his brave crew made multiple attempts to save two downed shipmates. “Lassen refused to give up on his brother aviators. Against all odds, he rescued the two grateful pilots from the certain hell of a North Vietnamese prison camp,” he told the audience. At that point, Linda Lassen, wife of the ship’s namesake, and Barbara Pilling, wife of Admiral Donald Pilling, retired vice chief of naval operations, stepped to the podium to begin the official commissioning ceremony. In Navy tradition, the two women are the ship’s sponsors. Commissioning is the most significant event of the triad that brings a ship to life: keel laying, christening and commissioning. The ceremony was sponsored by the Navy League of Tampa. Seventeen shots were fired from cannons in honor of Moore’s attendance at the ceremony. A Navy band, stationed at the end of the pier, played “Anchors Aweigh” as the Union Jack, a dark blue flag with 50 white stars signifying the 50 states, was raised from a short mast at the Lassen’s bow by a single sailor in dress whites. At the same time, a small red, white and blue commissioning pendant was run up a radar mast, the tallest point on the ship. Meanwhile, two contingents of sailors in white summer dress uniforms ran for the gangways at each end of the destroyer. Moments later, the young men and women who comprise the crew were evenly spaced at attention along the ship’s railing as the last two UH-2 Seasprite helicopters in the Navy — like the one Lassen few on the rescue mission — passed overhead. The USS Lassen had officially become this country’s 32rd Arleigh Burk class guided-missile destroyer. Its primary mission is to conduct sustained combat operations at sea. It’s capable of fighting air, surface and subsurface battles simultaneously with a myriad of 21st century offensive and defensive weapons. 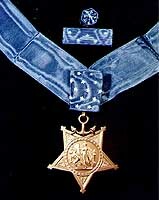 Clyde Lassen, who died from cancer in 1994, never thought he deserved the Medal of Honor for rescuing the two downed aviators. In his view it was what the Navy was paying him to do. Looking at the sleek, new $900 million fighting ship tugging at its mooring lines at dockside, one can’t forget the brief conversation Lassen had with Burns seconds after they landed safely aboard the USS Jewett in the Gulf of Tonkin half a lifetime ago. “I don’t know how to thank you gents,” Burns said as he was helped from his rescue helicopter. “We’ve been over here several months now. Nice to have something to do,” Lassen replied. I served on board the USS AUSTIN (LPD-4) from 12-71 – 4-73 and Commander Lassen was the Air Boss during this time frame. He was such a kind and gentle naval officer. I hadn’t known that he died in 1994, my belated condolences to his family. I had just returned from Vietnam in 11-71 and had orders for the AUSTIN. We are losing our great American heroes of yesterday. I have been a friend to a customer of mine, a Vietnam veteran who is dying of cancer. His cancer has mestastasized. Just two weeks ago, I learned that the cancer has gone into his lymphatic system. He is a walking dead man. His treatments of heavy doses of chemo has left him feeling like a nothing. He lives day by day. He lives for his wife. He still has his boots on. I have come by other vets too who have been forgotten. Another customer of mine was a Korean and Vietnam veteran. When I thanked him for his service to this country and for serving for me, he broke down and cried. At first I thought I somehow upset him. He tells me that I was only the third person in his life to thank him! He gave me a hearty handshake and thanked me! Wow. Only the third person… Another vet tells me he does’nt turn on the news because its so upsetting. What he has gone through, putting his life on the line for us, does not deserve what this administration is doing – fundamentally changing America from the ideals, morals, and principles that this Nation was founded on. So I will repost this story in honor of all combat veterans who put their lives on the line for us, for a belief, for God, Family, and Country! Last week I had the privilege to come by chance upon a Vietnam vet. He was a pilot. That’s all I know about him. He was a potential customer for me. Somewhere along the line He told me a story of a person he knew. This person he knew was Lt. Clyde E. Lassen. A Vietnam veteran who is unfortunately, not with us. So I share this story as told by Don Moore (not my customer) on his War Tales post. the stamp on the envelope.it turned out to be Lt. Lassen. Many of the officers in HC’7 made Captain , sadly Cdr Lasson was not among them He passed away at 54 years of age, beside the Frigate named in his honor there were 2 buildings one in Pensacola the other here at NSA Millington and the VA named a Fla, rehab center in his honor. Did Lt. Lassen ever serve out of Imperial Beach, Ca. Now NOLF? Then Ream Field?